Here’s the thing—furnaces are designed to last a long time! The typical natural gas furnace will last around 15 years, and an electric furnace might even go a few years beyond this. Of course, this is only true of the furnace is well cared for throughout the years. But even a well-maintained heater is going to have a real hard time giving you effective and efficient heat beyond a couple decades of use. You’ll notice a drop in efficiency by way of high heating bills, and other symptoms as well. This goes hand-in-hand with age. A newer system may need a repair or replacement part every now and then over the course of its lifespan. But an older furnace that needs multiple repairs over the course of a year is crying out for help. If you need multiple repairs throughout the year to keep your furnace running at an acceptable level, then, well, it’s just not acceptable! What’s happening is you are paying to put brand new parts in a system that’s likely going to break down soon anyway. A general rule of thumb is that if your next heating repair or set of repairs is going to cost half of what a new furnace is worth, it makes more economic sense to go with the replacement system. 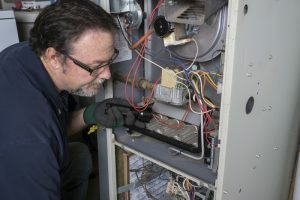 One major warning sign of a furnace that is in serious decline from age is a growing rise in the cost to run it at all. Compare your winter utility bills this year to that of last year. If you’re using your heater generally the same way as you did back then, but are paying far more than you did, it’s a sign that something is preventing the heaters from working as efficiently as possible. Is your heating system making loud, unsettling noises every time you turn it on and hear it running? A single strange noise is likely just a sign you need a repair. But if you’re hearing constant noises coming from your system, there’s a chance that it might be time to replace your furnace with a newer model. See what keeps our customers saying “I Love My Design Comfort!” Contact us today for whatever work you need on your HVAC system in Salt Lake City, UT.